Traditional, old-fashioned stovetop chocolate fudge is not that hard to make. One day I’ll prove that by posting a recipe and tutorial. But the process is a little time consuming. And there are days that you don’t want to wait for your delicious homemade concoction to boil, set and cool to creamy perfection. There are days that you just want to bite into a decadent piece of melt-in-your-mouth goodness as quickly as possible. At times like that, this recipe is all you need. Chocolate bliss is just two ingredients and two steps away. As quick as you can mix your favourite chocolate chips and sweetened condensed milk, you’re ready to enjoy some creamy, dreamy fudge. And the variations of this recipe are pretty much limitless. Use dark chocolate chips and stir in a cup of walnuts before spreading the fudge into the pan, or use white chocolate chips and coconut extract for a tropical treat. I added one teaspoon of peppermint extract to my fudge to satisfy my craving for mint chocolate. Pecans, crumbled cookies, raisins or crushed candy canes can all be stirred into your fudge before it’s pressed into the pan to set. The end result is always perfect and will satisfy the cravings of the most die-hard chocoholic. With fudge this easy, you may never want to bother with traditional stovetop fudge! Looking for more great chocolate recipes? Check out these AMAZING Double Reverse Chocolate Chip Cookies! Mouth-watering quick and easy fudge recipe that can be customized in a snap. Combine chocolate chips and sweetened condensed milk in bowl. Microwave at 50% power for approximately three minutes, stirring after each minute until smooth. Alternatively, combine chips and milk in saucepan and stir constantly over medium-low heat until smooth. Pour into greased foil-lined eight-inch square pan and chill until set. Lift fudge out of pan using the edges of the foil as handles and cut into one-inch squares. I would make it a 3 ingredient recipe and add walnuts. ok maybe 4 and add a splash of cognac. and chocolate frosting. oh and some espresso. what were we talking about again? Yummm vanilla or peppermint flavoring? In other words, just make it your own…. This was so easy and tasty ! And with 3 kids and 4 adults in the house, Im surprised it lasted a week…. Adeed matshmallows to the second batch. Can’t wait to try them. Thanks ! Absolutely it can, Beva! 🙂 Just make sure the chocolate is fully melted, so with more chips it may need a little more time and stirring. Hi Lottie! Sorry to hear that you’ve been having problems! First off, you may want to check the measurement of the sweetened condensed milk. Here in Canada, the standard can size is 10 oz, or 300ml. In the United States, I believe the standard cans are often 14 oz, so if that’s your can size, I’d either measure out ten ounces, or add an extra cup of chocolate chips. You could also try melting the chocolate in a small saucepan over VERY low heat. A too-hot microwave may be seizing the chocolate and changing the consistency. Finally, you may want to try letting the fudge sit at room temperature to set instead of chilling it. If the fridge has moisture or condensation in it, it may be affecting the firmness of the fudge when you chill it. yum! I’ll add nuts and marshmallows and call it a day! Ooh, marshmallows is a great idea! I’m actually tempted to make more today with butterscotch chips and pecans; Butter Pecan fudge is one of my favourites! If it takes the CHOCOLATE to make it set up, wouldn’t doing butterscotch pcs not set up? Cuz I like the butterscotch idea too. I wonder how peppermint schnapps would taste mixed in with the fudge. I only have 10 ounce can of sweetened condensed milk. Can I adapt the fudge by using less chocolate? Oh wow! That’s really easy! Sometimes simple is best. Oh that sounds awesome, Maria! I’ll have to give it a try for my peanut butter-loving boys! Hi when it says chill does that mean the freezer? As it hasn’t set by placing it in the fridge. Thank you ???? Hi Geraldine! That’s very strange, how long have you had it in the fridge? It honestly doesn’t even need the fridge usually, it just speeds up the firming process a bit. As soon as it cools, the chocolate should start to harden and gradually firm up your fudge. You can store it in the freezer once it’s set, but you shouldn’t need the freezer to set it. Thanks for your reply I used a bar of cooking chocolate with the condensed milk and mixed in a saucepan. I placed it in the fridge overnight when I cut into it, it was a semi solid gooey mess. So I place in the freezer for 3 hours, with the same result, the chocolate was firmer but the inside still stuck to the knife in a gooey mess. So I’ve obviously done something wrong! Not to worry, but thanks for your help ???? Hmm, how many ounces was the bar? I believe a standard box of cooking chocolate is about 8 oz, and 3 cups of chips is about 12 oz, so the fudge might have been a little low on the necessary chocolate it needed to firm up. From what I’ve found, the best technique if the fudge isn’t setting is to reheat it and reblend everything again to try to get the proper consistency (potentially mixing in more melted chocolate if that was the problem). Sorry I was too late to help with this batch, but hopefully this might help for next time! Baking chocolate is not the same as chocolate chips..they are not interchangeable.. try it again with the chocolate chips! What type of chocolate % is to be used.semi sweet, ? Absolutely you can, Valerie! I’ve done this before as well! Hi Kathi! You absolutely can, but you just need to make sure that you use a low heat on the stove, and make sure the pot is completely dry. Then just melt the two ingredients together until they’re smooth and pour them into the pan. (Moisture is a great enemy of chocolate, so even a tiny amount of water will stop the chocolate from melting properly.) Let me know how it goes! I want to make some of this fudge for Christmas presents. How long does this fudge keep? Hi Mandy! It’s a great Christmas gift for sure! 🙂 It keeps great in the freezer for months, and then can just be thawed and packaged for gifts. At room temperature, the fudge will last 1-2 weeks on average. It doesn’t really go bad because of the high level of sugar, but does dry out left at room temperature too long, so I definitely recommend freezing it if you’re going to use it as a gift later. Hope this helps! How much fudge does this make? Thanks! Hi Hannah! It fills an 8″ or 9″ square pan perfectly, and then I usually cut it into 1″ squares. So with an 8″ pan you should get about 64 pieces. If I had to guess, I’d say it’s probably about 2 lbs of fudge in all. Hope this helps! 😍 thanks, answered my question as well! Christmas is few days away and I’m excited to give this a try!! A cup is eight ounces. 🙂 Hope this helps! Bonjour Mireille! 10 oz. est de 300 ml (300 g). 3 tasses de pépites de chocolat est de 750 ml. Pardonnes toute erreur dans ma frappe; je ne parle pas très bien le français. Merci d’avoir lu mon blog! Hi do you have a recipe for diabetic fudge? Hi Jane! Most sugar-free chocolate can usually be used without issue in this recipe. For the sweetened condensed milk, the safest bet might be to make your own. Most people that use this recipe seem to find that it produces the same results as regular sweetened condensed milk. http://www.geniuskitchen.com/recipe/sweetened-condensed-milk-substitute-for-diabetics-143017 I can’t guarantee that it will work perfectly, but it sounds like it should. 🙂 I’d love to hear how it turns out if you give it a try! Hi! I have a silly question. I bought the ingredients for the fudge and the sweetened condensed milk is in a 14 fl ounce can how does that work when the recipe calls for 10 oz? I used a whole can and I want to say it was 14oz but not 100% sure. Have you ever tried the chocolate sweetened condensed milk? What would the difference be? More chocolatety lol? I made this over Christmas with dark chocolate and semi-sweet and added some marshmallows and it was a hit. It was so easy I will definitely be making this again!! That is so great to hear, Erin! I LOVE adding marshmallows; that extra gooiness gets me every time! What about using the low fat sweetened condensed milk? And sugar free chocolate chips? Délicieux et rapide! Je recommende!!! Hi Ashleigh! The answer to that would vary a little bit depending on the chocolate you choose, but when made with semi-sweet chocolate chips and cut into one-inch squares, a piece of fudge would have 78 calories and about ten grams of carbs. 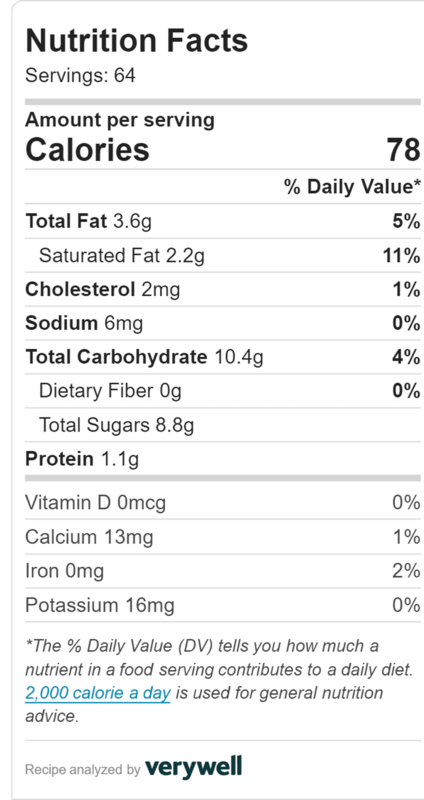 I’ve added a nutritional label above for you as well; hope this helps! I just wanted to make a comment. I have lined my 8×8 pan with plastic wrap for years or parchment paper. I just give the pan a light spray with non stick spray so the plastic sticks to the pan. Line the pan with the plastic wrap then pour in the melted fudge. I then top the fudge with another layer of plastic wrap. When chilled tip the pan upside down knocking the fudge out onto the cutting board peeling off the plastic from both sides. Cut while cold into desired sizes. I cut the 8×8 into 4 to wrap to give as a family gift or for daintier gifts I cut into 1″ cubes and set them into candy chocolate wrappers. Just remember 1″ cubes dry out very quickly so do them just before the gift giving. This is truly great recipe. I have been making it for years and have aslways used the 14 ounce s.c. milk and have never had a problem, even with every flavor add-in I’ve tried…. Maybe 20!! Half butterscotch half semi sweet chocolate is my favorite. Oh you will LOVE it, Lemonade! 🙂 My favourite thing about this recipe is that I can switch it up to another flavour so easily. Making it with peanut butter chips instead of chocolate and then stirring in Reese’s Pieces is heaven! I’m pretty sure we don’t have Reese’s in Australia and I am allergic to nuts…. what else do you suggest? Oh the possibilities are endless. 🙂 Using white chocolate with either rainbow sprinkles or Smarties candy stirred into it is another fun one. And using butterscotch chips makes an amazing butterscotch fudge. Or an amazing fudge can be as simple as adding a bit of orange or mint extract to the traditional chocolate fudge. Lots of times, that’s all I’ll do to add a little gourmet touch to my regular recipe! Do you have a recipe for an easy vanilla fudge? Hi Cathy! You can actually buy vanilla flavoured chips that you could use in this recipe to create a vanilla fudge! I would add an extra teaspoon of real vanilla extract for even more creamy vanilla flavour. 🙂 If you give it a try, please do let me know how it turns out! Sinc e every can of condensed milk I found says 14 oz, how much more of the chocolate chips would we need? Hate to waste the milk..
Hi Maime! Sorry for the delayed response on this! Some people still get good results just using the extra sweetened condensed milk without adding more chocolate, but for the most part, I’ve found an extra cup of chocolate chips (so four cups total) will give you that perfect fudge texture when using the larger 14oz. can. 🙂 Hope this helps! I don’t quite understand, you said to melt choc. chips & S.C. Milk in microwave till smooth. Then you said to alternatively combine chips & milk in saucepan over medium-low heat until smooth. Couldn’t you just cook everything in the saucepan over med.-low heat? Hi LaVerne! Alternatively basically means “instead of, if you prefer.” So you just choose the method you like best, stove-top or microwave, and use that one. 🙂 Hope this helps! Isn’t this the Rachel Ray recipe? Nope! It’s actually an old recipe my mom used to make when I was a child. Since there are only two ingredients, I’m sure there are many variations of it out there, though. 🙂 Hope you enjoy this one! I add a pinch of sea salt and a tsp vanilla, plus pecans or black walnuts. Fast & Fabulous. Can i use nutella instead of chocolate chips? Hi Zuhrie! Unfortunately that wouldn’t work because you need the firmness of the chocolate to make the fudge set properly. However, if you’re craving that Nutella flavour, you can make a delicious fudge by melting two cups of Nutella with two cups of semi-sweet chocolate chips!